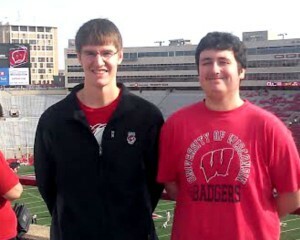 Alan, left, taking in a UW Badgers game with a friend. Like many traditional students, Alan Kieffer entered college without a clear career path in mind. He was passionate about fitness and health, but he had no idea how to make the leap from healthy hobby to successful career in corporate wellness. After earning his associate degree from UW-Marshfield and dabbling in physical education courses at UW-La Crosse, Alan discovered the University of Wisconsin Health and Wellness Management program through an online search. “I’ve always been interested in physicality and fitness,” said Alan, “and I knew I needed to do something with a lot of career potential. It made sense to enroll in the UW Health and Wellness Management program.” For Alan, this online degree program had two major appeals—it was a subject he could fully engage in, and it offered exciting career opportunities. Alan’s foresight proved accurate. Soon after he graduated in the spring of 2014, he was offered a job as fitness coordinator for Sentry Insurance, a corporation committed to offering its employees a superior quality of life. Alan is excited about his work assisting Sentry employees in their wellness journeys, and he credits his premium job placement to the top-notch education he received while working toward his UW Health and Wellness Management degree. The program’s well-rounded curriculum provides students the skills and knowledge they need to build, promote, and maintain an effective corporate wellness program—everything from human anatomy and health literacy to marketing communications and research and statistics. Between a full-time, variable-schedule job, a family, and a busy roster of sports and activities in his off time, Alan thought it would be hard to find time for schoolwork. “Outside of work, I’m a huge sports fan. I love to golf, disc golf, play basketball. I think it’s really important to be active.” He’s also a loyal fan of the Badgers, Packers, and Brewers—a full roster of spectator sports. So how does he fit it all in? “The online format allowed me to do schoolwork when it was convenient for me. I didn’t have to worry about fitting work and activities in around school—I could fit school in when I wasn’t working or enjoying other activities.” Alan took to the online format much more easily than he expected. He was able to pace his work to meet his needs, and he welcomed the chance to exercise the self-discipline that will come in handy when he’s motivating himself—and others—to reach their wellness goals. Alan was impressed with how well the online UW Health and Wellness Management program handled communication between students, faculty, and program advisers. Easily accessible discussion boards allowed students to come and go as needed and contribute once they’d had the time to develop an opinion—leading to a more considered, constructive conversation. And while group projects are always a unique challenge, Alan was pleased that the courses promoted an “in-this-together” mentality. As he made his way through the program, Alan built relationships with his fellow classmates. This collaborative and encouraging environment helped Alan think of his education as a team effort—a mindset he happily related to. Alan is utilizing those skills in his role at Sentry. As fitness coordinator, he is responsible for the day-to-day operations of the corporate fitness center. A social person, Alan loves the daily interaction he has with customers and staff. Because the facility is only open to Sentry employees, retirees, and their families, he sees familiar faces on a regular basis and enjoys a bigger opportunity to make a difference in their lives. In the last session Alan organized, he featured classes such as Zumba, Core Stretch and Sculpt, Aqua Zumba and Fitness, and Butts and Guts, a workout focusing on core strength. Another perk of a health and wellness career is the day-to-day variety of activities. “I get to meet all kinds of different people, and there’s really no ‘normal week’—fitness is always changing!” In the warmer months, when busy schedules naturally decrease gym participation, he likes to promote his programs and take advantage of beautiful weather. He recently led a Couch-to-5K course for employees interested in taking up running to enjoy the outdoors while maintaining their health and wellness. Alan has high hopes for his future. His ultimate dream is to become a health and wellness director. With the strong foundation of a reputable University of Wisconsin bachelor’s degree in health and wellness management, plus the experience he is gaining at Sentry Insurance, Alan is ahead of the game and gaining on his goals. Want to start or advance your career in health and wellness? Find out more about the UW Bachelor of Science in Health and Wellness Management and how it can help you land your dream job. Call 1-877-895-3276 or email learn@uwex.edu to speak with a helpful enrollment adviser today.